Auld Reekie Writing announce the publication of Alistair Rutherford’s novella, Dex Delphi and the Gold Mine. We are thrilled to say that the debut publication from Edinburgh based writer Alistair Rutherford is now available to buy for Kindle. Dex Delphi and the Gold Mine is the first book in a new series of cosy crime mysteries, set in Scotland (and beyond) during the 1940s. Alistair Rutherford writes for the screen, radio, stage and page. With over fourteen years of professional experience he has written scripts for the BBC, Ko Lik Film, Encaptivate Film, Storymix and the Stroke Association UK. Whether he’s writing a fast-paced thriller, science fiction epic, romantic comedy or historical drama, he uses his wry observational skills and flair for dialogue to bring characters and stories fully and vividly to life. A private detective, his trusty old batman and a brand new assistant combine their varied talents and, in the case of the assistant, complete lack of experience, to solve a gold bullion robbery that has Scotland Yard well and truly baffled. Dex Delphi is a private detective who doesn’t mind breaking a few rules and treading on toes to solve crimes. As honest as the day is long, Delphi goes about things in his own way, much to the annoyance of some members of the Police. After a small-scale criminal dies in his office, Delphi is hot on the trail of a fortune in stolen gold bars. Close behind are the Police and it’s up to Dex, his batman Banks and new assistant Samantha to bag the criminals before they flee the country for ever. Dex Delphi and the Gold Mine is a cosy crime thriller set in London and the Highlands of Scotland during the late 1940s. It is the first novella in the Dex Delphi series written by Scottish author Alistair Rutherford. The adventures will continue in book two, Dex Delphi and the Atom Smasher, due to be released in summer 2015. 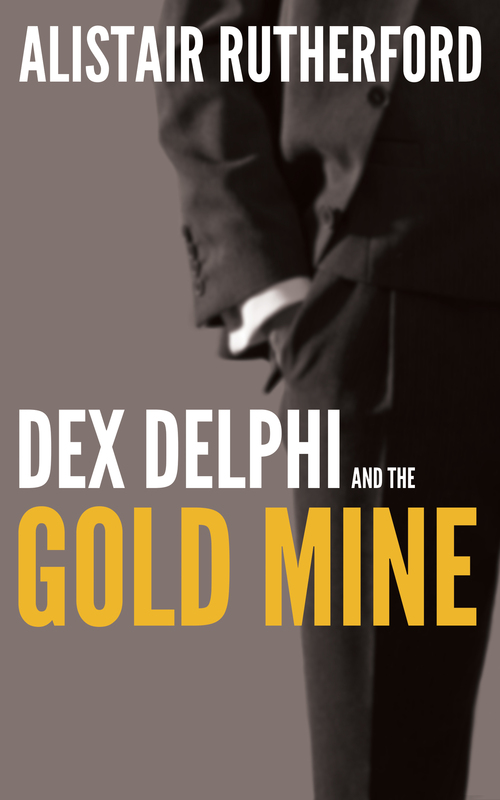 Purchase Dex Delphi and the Gold Mine now for your Kindle-friendly devices. Find out more about Alistair Rutherford. Connect with Auld Reekie Writing on Facebook to stay up to date on Alistair’s news.